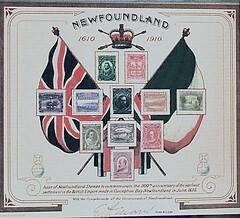 The Guy Issue of Newfoundland Stamps printed in 1910 commemorated the 300th Anniversary of the Cupids Colony. At that time Newfoundland was a self-governing colony within the British Empire, having achieved responsible government in 1855. [Newfoundland did not join the Canadian Confederation until 1949] These stamps are very interesting, because of their design and the fact that they are Newfoundland stamps. In 2010, we are celebrating the 400th Anniversary of Cupids, a milestone, not only for the tiny town of Cupids and for the Baccalieu Trail area. The 400th Anniversary of the first English settlement in Canada and the second English settlement in North America (following Jamestown in Virginia) is a momentous event in world history. Once the British Empire had established a toehold in Jamestown and Cupids, it went on to become the predominant power in the colonization of North America. Over the centuries, many have passed judgement on the behaviour of colonial empires. After four hundred years, we cannot change what has happened. However, we know that the development of the first British colony, in what was to become Canada, was a turning point in world history, which changed the lives of many groups of people in many different parts of the world. What makes this set of stamps really interesting is their portrait of history. On May 2, 1610, the London and Bristol Company received a charter from King James I of England allowing them to start a settlement in Newfoundland. In August of the same year, a group of colonists led by John Guy arrived at Cupers Cove and began building the new colony. By this time, Newfoundland had been visited by fishermen from Europe every summer for over 100 years, but they arrived in the spring and sailed home at the end of the fishing season. Cupers Cove was the first European settlement in Newfoundland since the Vikings had visited the island over 600 years before. Cupids in 1910, issued to commemorate the 300th Anniversary of the founding of the First English Settlement in Canada. The houses are traditional Newfoundland saltbox houses. The ‘Endeavour’ was not the ship that Guy sailed to Cupers Cove. Mosquito, which was renamed Bristol’s Hope in 1910 during the 300th anniversary of John Guy’s settlement, is located between the modern communities of Harbour Grace and Carbonear. Robert Hayman was the first Governor, perhaps in 1618. While in Newfoundland he spent much of his time writing and translating poetry. His book of poetry “Quodlibets, lately come over from New Britaniola, Old Newfound-land” was printed in 1628. Much of the poetry in the book praised and encouraged Newfoundland settlers. It was the first book of poetry written in English in the New World. Grand Falls is the name of the spectacular falls on the Exploits River in central Newfoundland. At the time when these stamps were printed in 1910, the Pulp and Paper Mill in Grand Falls was the most significant new industry in Newfoundland and Labrador. The construction of the pulp and paper mill had been completed in 1909. It was supplied with power from the falls, it was on the route of the railway, and it had access to the seaport of Botwood. Ironically, the Pulp and Paper Mill was closed by AbitibiBowater on February 18, 2009, in the midst of considerable controversy. Premier Danny Williams, on behalf of the provincial government of Newfoundland and Labrador, expropriated AbitibiBowater’s provincial assets and contractual rights to natural resources. These resources included considerable hydroelectric resources and land and timber rights. The case is in the courts. Logging Camp Red Indian Lake. With the Pulp and Paper Industry came logging camps. Although life in the camps was extremely hard, they provided a living for a large number of families for over 100 years, until the Pulp and Paper mill closed in 2009. King James I, who awarded the charter to John Guy to establish the “earliest settlement in the British Empire” in 1610, was the child of Mary, Queen of Scotts and Lord Darley. His father was assassinated under mysterious circumstances before he was one year old, and his mother was imprisoned by Elizabeth I in London tower. He succeeded Elizabeth I, because he was the closest relative to an unmarried and childless queen. His son, Charles I, was executed. He is recognized as an intellectual and a scholar, who encouraged the development of cultural activities and the arts. He is perhaps best know today because he authorised the production of the King James Version of the Bible. Lord Bacon was a member of the Bristol and London Company that established the colony in Cupids. He was one of the great intellects of his age to the extent that there have been claims that he actually wrote Shakespeare’s plays. He was a philosopher, who delineated the principles of the inductive method of reasoning. He coined the expression, “Knowledge is power.” He was a powerful political figure, but eventually removed from office for accepting a bribe. Edward VII was the son of Queen Victoria and Albert. His mother, Queen Victoria, was a dominating power who lived a very long life. As a result, he was best known for indulging himself in women, food, drink, gambling, sport and travel. He passed away in 1910 while the Guy Issue of Stamps was being prepared. King George V, Edward’s son, lived through a time of great world upheaval. He was king during World War I, the communist Russian Revolution, and the Great Depression. During his reign, the name of the royal family was changed from Saxe-Coburg-Gotha to Windsor, due to anti-German sentiment in England. In 1917, he refused to allow Tsar Nicholas II and his family (Nicholas II was his cousin) political asylum in England. Tsar Nicholas II and his family were later assassinated during the revolution. He began the tradition of broadcasting a “Christmas Message” to the people.